. 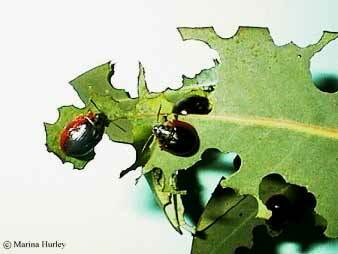 : Farm Forest Line - Managing insect pests :. Ideally, choosing tree species that are suited to the local environment is best, as the local ecology will help reduce any insect pest outbreaks. Vigorous, healthy plants will either be less likely to sustain an attack or if so, will deal with it better than stressed, poorly-growing trees. Regular thinning and pruning may reduce attack in some circumstances, especially if trees are attacked by caterpillars, making it more difficult for infestations to spread from tree to tree. Debarking trees immediately after felling may reduce attacks of wood-boring beetles. Often the natural enemies of insects will effectively control small, periodic outbreaks including predators, parasitoids and pathogens. Ensuring that the understorey is diverse as possible will help encourage populations of natural enemies. The decision process involved when undertaking insect control is not straightforward and can require detailed knowledge of the insects biology. Correctly identifying the pest is very important. Similar-looking pests may require different control methods. Some insects are nocturnal or live in the soil and are not necessarily present when damage inspection is taking place. Similar damage to leaves and seedlings can be caused by both insects and mammals, and birds may be responsible for pulling up seedlings by their roots. Knowing when to apply chemical or microbial insecticide is important, as applications need to be carried out before the population has reached damaging proportions.